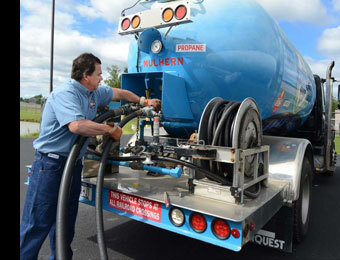 Mulhern Gas Company of Columbia County provides the exceptional energy of propane gas. What makes propane an exceptional energy? Millions worldwide are using propane to make their lives more comfortable. Of course, that's not surprising. After all, the advantages of propane are tough to beat. Propane is an environmentally friendly choice you can make today. Because propane burns cleaner, works harder, and operates smarter, choosing propane means you can help reduce greenhouse emissions, save energy, and protect the environment. Clean Propane is clean burning and non-toxic. Because of it low carbon content, homeowners can help cut greenhouse gas emissions, improve air quality, and protect the environment. Reliable Propane works when and where other energy sources don't. You can live and work wherever you choose — city or country — even if it's far from the gas main or power grid. Propane will be there when you need it. And almost 90 percent of all propane is produced right here in the United States, so you can always count on it. Good value Propane can offer significant savings over the alternatives. It provides great value because it burns hotter and more efficiently than many other energy sources, powering a variety of high-performance and energy-efficient appliances. Safe Propane has built-in safety properties along with stringent safety regulations. It won't ignite when combined with air unless the source of ignition reaches 940°F. Propane gas is nontoxic and produces minimal emissions.It is not harmful to soil or water. For more about propane, please visit these in-depth websites. © 2017 Mulhern Gas Co. All rights reserved.